ABSTRACT: BACKGROUND: Brief clinician delivered advice helps in tobacco cessation efforts. This study assessed the impact of our intervention on instances of advice given to dental patients during visits on tobacco use quit rates 6 months after the intervention. 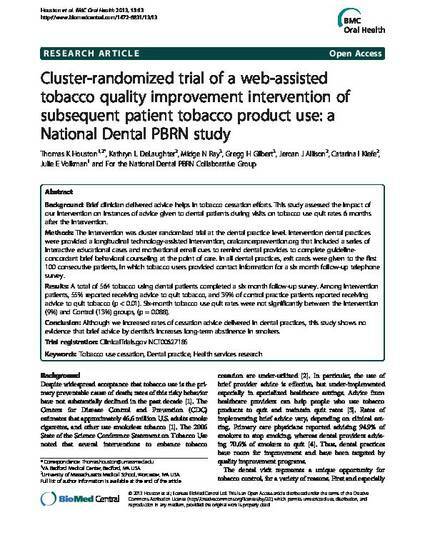 METHODS: The intervention was cluster randomized trial at the dental practice level. Intervention dental practices were provided a longitudinal technology-assisted intervention, oralcancerprevention.org that included a series of interactive educational cases and motivational email cues to remind dental provides to complete guideline-concordant brief behavioral counseling at the point of care. In all dental practices, exit cards were given to the first 100 consecutive patients, in which tobacco users provided contact information for a six month follow-up telephone survey. RESULTS: A total of 564 tobacco using dental patients completed a six month follow-up survey. Among intervention patients, 55% reported receiving advice to quit tobacco, and 39% of control practice patients reported receiving advice to quit tobacco (p < 0.01). Six-month tobacco use quit rates were not significantly between the Intervention (9%) and Control (13%) groups, (p = 0.088). CONCLUSION: Although we increased rates of cessation advice delivered in dental practices, this study shows no evidence that brief advice by dentist's increases long-term abstinence in smokers.Trial registration: ClinicalTrials.gov NCT00627185.